ADT has been in the security business for more than a century. You don’t stick around that long unless you’re good at what you do, and ADT is among the best when it comes to home security. As a forward-thinking company, ADT has made the move into home automation as well, blending the convenience of home automation with top-notch home security. Monitors your Pulse system 24/7. Sends alerts to your smartphone or tablet. Enables you to control your home’s lights and thermostats. Allows you to remotely arm and disarm the system. Uses Z-Wave technology, so it may be compatible with your existing home automation devices. Utilizes a wall-mounted touchscreen for easy control in your home. The Pulse web portal allows you to access your system from any web browser on any computer, so long as you have Internet access. View live camera feeds from your computer or smart device. 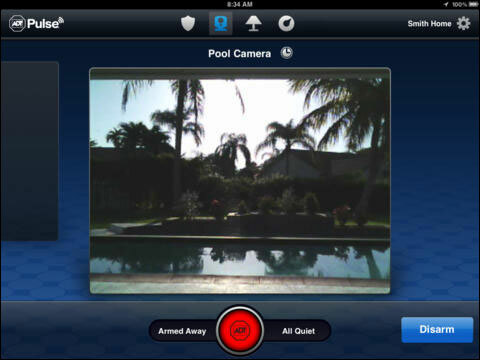 Use the Pulse app on your iOS or Android smartphone or tablet to remotely control and adjust settings for your system. Credit: Image courtesy of ADT Security Systems. Of course, ADT charges a monthly fee to monitor your home. If that’s not something that puts you off, however, then ADT Pulse is well worth looking into.